Examine the costs, risks, and benefits of patent litigation in 23 countries, and discover a formula for putting a dollar value on a patent case anywhere in the world! Today’s leading corporations and universities operate in a world of globalized economies and international competition. While patents and their enforcement are national in nature, infringement disputes frequently extend beyond national borders. This updated Second Edition of Global Patent Litigation: How and Where to Win will help multi-national companies, research universities, and their counsel with answers to critical questions on developing and implementing an effective global patent litigation strategy. You’ll find in-depth examination of the costs, risks, and benefits of patent litigation in 23 of the most commercially developed countries. This 1,800-page Second Edition guide includes objective patent litigation data, including time and cost to trial and patentee win rates, and provides a formula for putting a dollar value on filing a patent lawsuit anywhere in the world. This resource also analyzes the procedural and substantive differences between different legal systems and includes distinctive “at a glance” charts allowing for clear cross-country comparisons. The newly released Second Edition treatise also includes chapters and executive summaries of all key data points for 23 individual countries, covering each nation’s court structure, main characteristics of patent litigation, infringement conditions and defenses, evidentiary process, preliminary injunction, remedies and damages, compensation of costs, border enforcement, and more. 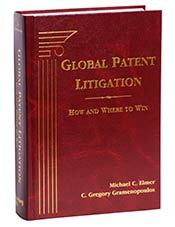 The authors of Global Patent Litigation are Michael C. Elmer, Senior Counsel at Finnegan, Henderson, Farabow, Garrett & Dunner, LLP, in Palo Alto, CA, and C. Gregory Gramenopoulos, a partner at Finnegan, Henderson, Farabow, Garrett & Dunner, LLP, in Washington, DC.